We will visit the North Shore mountains and hike a backcountry trail minutes from the city. 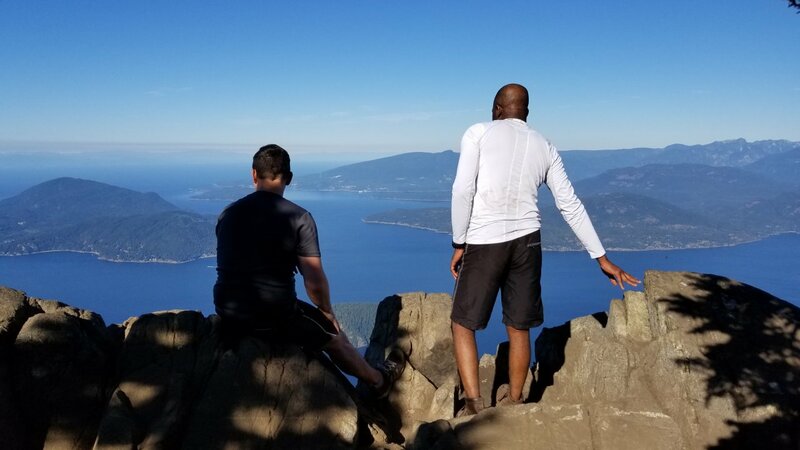 We'll start out fairly easy, with steeper more difficult sections near the finish, and be rewarded with some beautiful views of the Gulf Islands and Howe Sound. The hike will take four to five hours cover 10km and over 500m of elevation, and we will stop for snacks to enjoy the scenery. Meet at Bean Around The World at Lonsdale Quay at 7:00am. We will then drive to our starting point along the sea to sky highway. The hike will last roughly 4.5 hours for the roundtrip. Arrival time back at Lonsdale Quay is 1:00. Proper attire. This can not be stressed enough. Please wear comfortable hiking boots and sports wear. Dry fit clothing is an excellent option. Make sure to bring water! This is a 5 hour trip. If you want to get some great pictures, be sure to bring your camera as well.